Having trouble getting kids to pay attention to math because of the holiday season? Are they too busy thinking about the coming vacation, imagining about building snowmen and popping firecrackers? Maybe this game will help! Christmas Math consists of several math-related games melded in a package that contains snowmen, Christmas ornaments, fire crackers, and gifts. Players are asked to perform number counting, matching, ordering, and sequencing, depending on the type of game chosen. Competitive games could be formed by letting the kids form groups and challenge each other to completing the most games without any mistakes. Perfect for keeping students engaged… at least until the final bell rings! 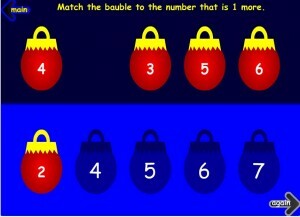 This entry was posted in Maths and tagged christmas, counting, k4, matching, math, ordering, sequencing by Majorie. Bookmark the permalink.